Wraps can be made by rolling a curry inside chappati or tortilla, and served with green chutney or tomato sauce. Wraps make a quick and wholesome meal. You can easily make wraps with little effort. Here’s a simple recipe that you can make in a jiffy. Though I have posted corn-capsicum wrap in minimalistic cooking section, the elaborate recipe without ready-to-eat components is given below for the benefit of interested readers. *You may use a cheese slice instead of cooking cheese. Cut the slice into half and place it over the corn masala. Method: Heat oil in a kadai/wok, add chopped onion and fry till it becomes transparent. Add tomato pieces, capsicum pieces, salt, chilli powder and sugar. Mix well. Cover and cook on low flame till tomato pieces become pulpy and oil separates. Now add sweet corn and oregano. Mix well and cook for one minute. Switch off the fire. Microwave tortilla or warm ready-to-eat chappati on the tava, and place it on a plate. Place the corn masala in the center (Fig.1) of the chappati/tortilla. Sprinkle grated cheese or place the cheese slice on the masala (Fig.2). Wrap the left end of chappati/tortilla over the masala, and then roll the chappati/tortilla from left to right tightly with the masala inside into a compact roll (Fig.3). 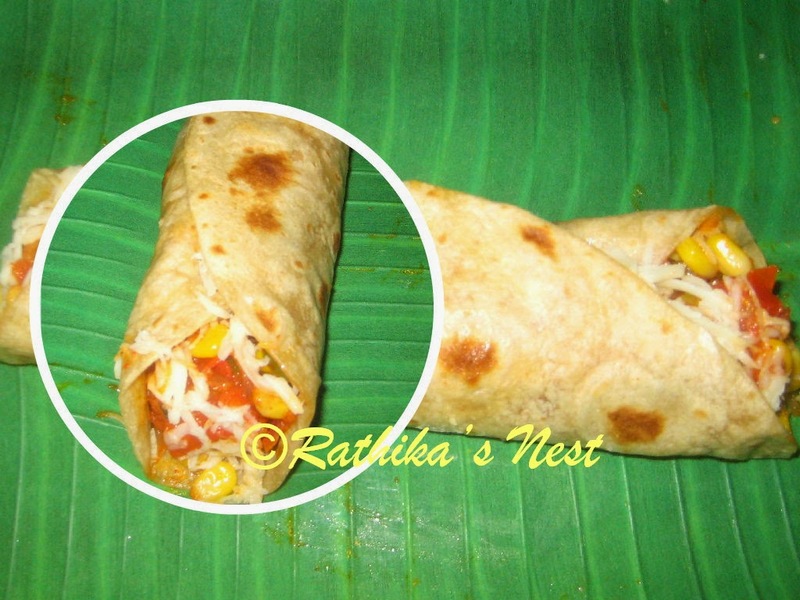 Your yummy corn-capsicum wrap is ready! Serve with tomato ketch up. Elaborate recipe: You can make this wrap without ready-to-eat ingredients. Husk the sweet corn, and remove the kernels. Place the corn kernels in a vessel and steam them in a pressure cooker or idly cooker for 5-10 minutes. DO NOT place the cooker weight. Once ready, remove from the cooker, cool and use it instead of ready-to-eat sweet corn. Some of you may want to make wrap chappatis at home. Click here to find out how to make them. Use homemade wrap chappatis instead of ready-to-eat tortillas or chappatis. Rest of the recipe remains the same. Adjust the ingredient quantity as per your requirement.